Epic fruit platter with healthy chocolate fondue! So yum and fun! Ok! Who is sick of the same ole same ole brekky? *all hands up* it’s time to jazz things up and we think this epic fruit platter with healthy chocolate fondue is the BEST. BREKKY. EVER. So good that it can double as an epic (easy) dessert. In fact, we reckon this would make the PERFECT Valentine’s Day dessert. You can make it together… then feed it to each other. OR you can just make it for yourself and feed it to yourself because #selflove is more important anyway! The best part about this recipe is that it takes 10 minutes to make… and yes… cute fruit shapes are compulsory! Ok! You have dessert sorted… now go and check out our step-by-step to create the most amazing Valentine’s Day dinner for your favourite person (and yes, that can be YOU!). Cut up your fruit cute, we even used mini cookie cutters because SAH cute. For the choccy fondue yumness, whiz everything in your blender until super smooth. 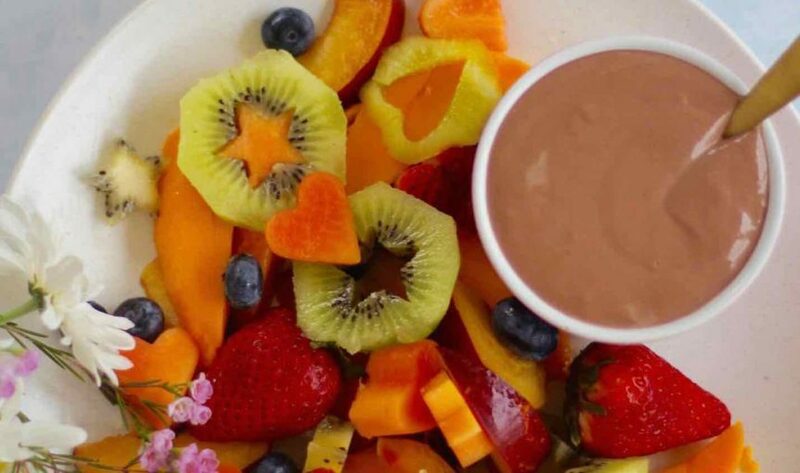 Dip fruit into the choccy yumness and eat it all up! This would be the cutest date night dessert!